Rectangle Patterns and Stock Charts Patterns Explained for You! Rectangle patterns are chart patterns that contain price movements and forms as a trading range between two price movements. They are considered as a continuation pattern, but at times also can be a reversal pattern. You need a minimum of four points to draw a rectangle: The upper line connects two rally tops, and the lower line connects two bottoms. The upper line shows where bulls run out of steam; the lower line shows where bears become exhausted. So a rectangle shows that bulls and bears are evenly matched. Rectangle patterns are also known as Trading Ranges, Consolidation Patterns, Flat Base and a Sideways Pattern. Rectangles can can extend for a few weeks or many months. Rectangles can be used for Breakout Trading or Swing Trading. 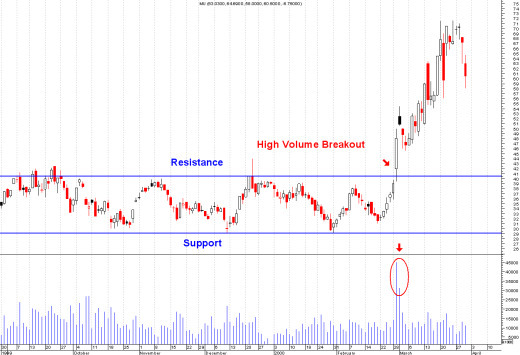 Breakout Trading: If share volume swells when price approaches the upper border, an upside breakout is more likely. Visa Versa on the downside. A valid breakout from a rectangle is confirmed by large increase in volume; one-third to one-half higher than the average of the previous five days. If volume is thin, it is likely to be a false breakout. Confirm the breakout with the ADX indicator. Most times there will be a pullback in price after the breakout. Swing Trade: When Swing Trading within a rectangle, buy at the lower boundary, and sell short at the upper boundary. The RSI indicator or Stochastic indicator will help you decide when to buy and sell. The rectangle-pattern is simple strategy to use in your stock trading system! Return from "Rectangle-Patterns" to the Home Page: "Stock Market For Beginners"